Most people have a very misled, unrealistic view of “science”. A very damaging consequence is that scientific claims are given automatic respect even when that is unwarranted — as it always is with new claims, say about global warming. Dramatic changes in how science is done, especially since mid-20th century, make it less trustworthy than earlier. In 1987, historian John Burnham published How Superstition Won and Science Lost, arguing that modern science had not vanquished popular superstition by inculcating scientific, evidence-based thinking; rather, science had itself become on worldly matters the accepted authority whose pronouncements are believed without question, in other words superstitiously, by society at large. Burnham argued through detailed analysis of how science is popularized, and especially how that has changed over the decades. Some 30 years later, Burnham’s insight is perhaps even more important. Over those years, certain changes in scientific activity have also become evident that support Burnham’s conclusion from different directions: science has grown so much, and has become so specialized and bureaucratic and dependent on outside patronage, that it has lost any ability to self-correct. As with religion in medieval times, official pronouncements about science are usually accepted without further ado, and minority voices of dissent are dismissed and denigrated. G. K. Chesterton once suggested that the best argument for accepting the Christian faith lies in the reasons offered by atheists and skeptics against doing so. That interesting slant sprang to mind as I was trying to summarize the reasons for not believing the “scientific consensus” that blames carbon dioxide for climate change. –> Temperatures decreased between the 1940s and 1970s, and since about 1998 there has been a pause in warming, perhaps even cooling, while CO2 levels have risen steadily. But disbelieving the official propaganda becomes much easier when one recognizes the sheer absurdities and illogicalities and self-contradictions committed unceasingly by defenders of the mainstream view. Mainstream official climate science is centered on models: computer programs that strive to simulate real-world phenomena. Any reasonably detailed description of such models soon reveals that there are far too many variables and interactions to make that feasible; and moreover that a host of assumptions are incorporated in all the models (1). In any case, the official models do not simulate the cooling trend of these three decades. “Dr. James Hansen suspects the relatively sudden, massive output of aerosols from industries and power plants contributed to the global cooling trend from 1940-1970” (2). But the models do not take aerosols into account; they are so flawed that they are unable to simulate a thirty-year period in which carbon emissions were increasing and temperatures decreasing. An obvious conclusion is that no forecast based on those models deserves to be given any credence. “40’s to 70’s cooling, CO2 rising? This is a fascinating denialist argument. 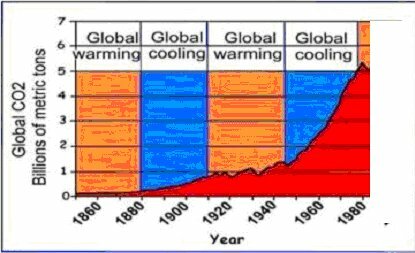 If CO2 is rising, as it was in the 40’s through the 70’s, why would there be cooling? Fair enough; but the models fail to take account of natural cycles. The Soviet Union had an official encyclopedia that was revised as needed, for example by rewriting history to delete or insert people and events to correspond with a given day’s political correctness. Some climate-change enthusiasts also try to rewrite history: “There was no scientific consensus in the 1970s that the Earth was headed into an imminent ice age. Indeed, the possibility of anthropogenic warming dominated the peer-reviewed literature even then” (3). Compare that with a host of reproductions and citations of headlines from those cold times when media alarms were set off by what the “scientific consensus” indeed then was (4). And the cooling itself was, of course, real, as is universally acknowledged nowadays. The media faithfully report what officialdom disseminates. Routinely, any “extreme” weather event is ascribed to climate change — anything worth featuring as “breaking news”, say tsunamis, hurricanes, bushfires in Australia and elsewhere. But the actual data reveal no increase in extreme events in recent decades: not Atlantic storms, nor Australian cyclones, nor US tornadoes, nor “global tropical cyclone accumulated energy”, nor extremely dry periods in the USA, in the last 150 years during which atmospheric carbon dioxide increased by 40% (pp. 46-51 in (1)). Nor have sea levels been rising in any unusual manner (Chapter 6 in (1)). Defenders of climate-change dogma tie themselves in knots about whether carbon dioxide has already affected climate, whether its influence is to be seen in short-term changes or only over the long term. For instance, the attempt to explain 1940s-70s cooling presupposes that CO2 is only to be indicted for changes over much longer time-scales than mere decades. Perhaps the ultimate demonstration of wanting to have it both ways — only long-term, but also short-term — is illustrated by a pamphlet issued jointly by the Royal Society of London and the National Academy of Science of the USA (5, 6). Some official sources deny that there has been any cessation of warming in the new century or millennium. Others admit it indirectly by attempting to explain it away or dismiss it as irrelevant, for instance “slowdowns and accelerations in warming lasting a decade or more will continue to occur. However, long- term climate change over many decades will depend mainly on the total amount of CO2 and other greenhouse gases emitted as a result of human activities” (p. 2 in (5)); “shorter-term variations are mostly due to natural causes, and do not contradict our fundamental understanding that the long-term warming trend is primarily due to human-induced changes in the atmospheric levels of CO2 and other greenhouse gases” (p. 11 in (5)). “Should climate models have predicted the pause? Media coverage … of the launch of the 5th Assessment Report of the IPCC has again said that global warming is ‘unequivocal’ and that the pause in warming over the past 15 years is too short to reflect long-term trends. We should not confuse climate prediction with climate change projection. Climate prediction is about saying what the state of the climate will be in the next few years, and it depends absolutely on knowing what the state of the climate is today. And that requires a vast number of high quality observations, of the atmosphere and especially of the ocean. On the other hand, climate change projections are concerned with the long view; the impact of the large and powerful influences on our climate, such as greenhouse gases. Projections capture the role of these overwhelming influences on climate and its variability, rather than predict the current state of the variability itself. The IPCC model simulations are projections and not predictions; in other words the models do not start from the state of the climate system today or even 10 years ago. There is no mileage in a story about models being ‘flawed’ because they did not predict the pause; it’s merely a misunderstanding of the science and the difference between a prediction and a projection. … the deep ocean is likely a key player in the current pause, effectively ‘hiding’ heat from the surface. Climate model projections simulate such pauses, a few every hundred years lasting a decade or more; and they replicate the influence of the modes of natural climate variability, like the Pacific Decadal Oscillation (PDO) that we think is at the centre of the current pause. 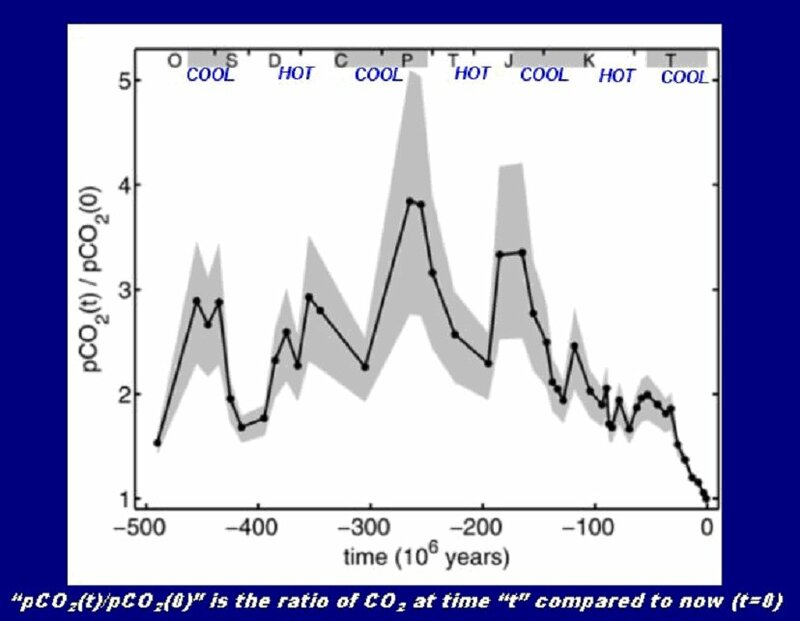 The projections — which the media (as well as people familiar with the English language) fail to distinguish from predictions — that indict carbon dioxide as cause of climate change are based on models that do not incorporate possible effects of deep-ocean “hidden heat” or such natural cycles as the Pacific Decadal Oscillation. Those and other such factors as aerosols are considered only in trying to explain why the climate models are wrong, which is the crux of the matter. The climate models are wrong. 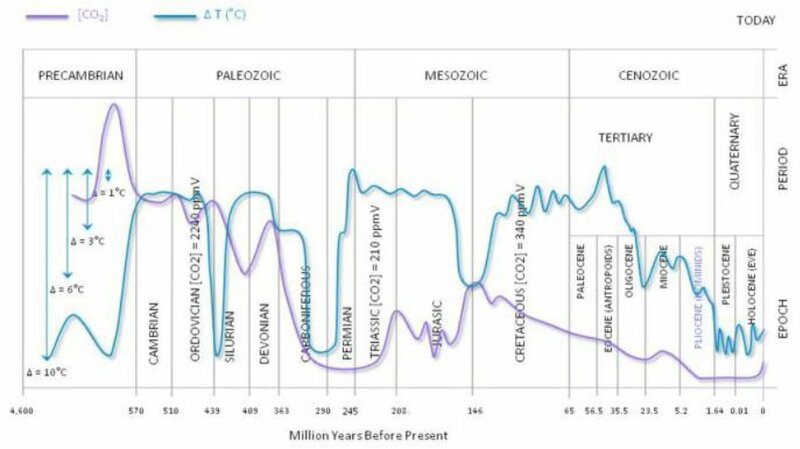 Leave aside that the warming cannot be known to be “unprecedented” — global temperatures have been much higher in the past, and historical data are not fine-grained enough to compare rates of warming over such short time-spans as mere decades or centuries. There is no such thing as “95% certainty”. Certainty means 100%; anything else is a probability, not a certainty. A probability of 95% may seem very impressive — until it is translated into its corollary: 5% probability of being wrong; and 5% is 1 in 20. I wouldn’t bet on anything that’s really important to me if there’s 1 chance in 20 of losing the bet. In other words, 3% (“on average”) of “publishing climate scientists” disagree. And the history of science teaches unequivocally that even a 100% scientific consensus has in the past been wrong, most notably on the most consequential matters, those that advanced science spectacularly in what are often called “scientific revolutions” (8). Furthermore, “publishing climate scientists” biases the scales a great deal, because peer review ensures that dissenting evidence and claims do not easily get published. In any case, those percentages are based on surveys incorporating inevitable flaws (sampling bias as with peer review, for instance). The central question is, “How convinced are you that most recent and near future climate change is, or will be, the result of anthropogenic causes”? 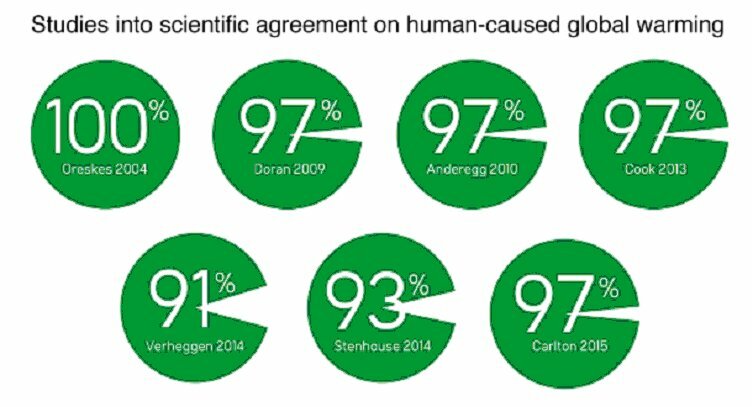 On that, the “consensus” was only between 33% and 39%, showing that “the science is NOT settled” (9; emphasis in original). The media and countless individuals treat the climate-change consensus dogma as Gospel Truth, leading to such extraordinary proposals as that by Professor of Law, Philippe Sands, QC, that “False claims from climate sceptics that humans are not responsible for global warming and that sea level is not rising should be scotched by an international court ruling”. I would love to see any court take up the issue, which would allow us to make defenders of the orthodox view attempt to explain away all the data which demonstrate that global warming and climate change are not driven primarily by carbon dioxide. 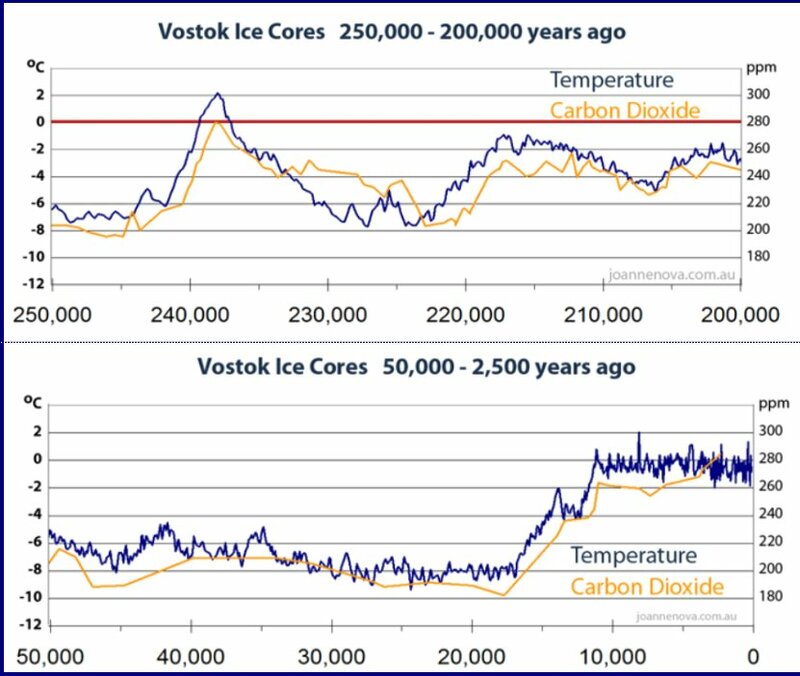 Official alarms and established scientific institutions rely not on empirical data, established facts about temperature and CO2, but on computer models that are demonstrably wrong. Those of us who believe that science should be empirical, that it should follow the data and change theories accordingly, become speechless in the face of climate-change dogma defended in the manner described above. It would be screamingly funny, if only those who do it were not our own “experts” and official representatives (10). Even the Gods are helpless in the face of such determined ignoring of reality (11). (11) “Mit der Dummheit kämpfen Götter selbst vergebens”; Friedrich Schiller, Die Jungfrau von Orleans.